Three East Hawaii teachers will participate in an international exchange with their Chilean counterparts. From left is Tom Chun, Sonya Carvalho, Mayor Harry Kim and Roddy Floral. 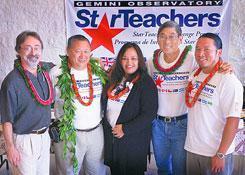 Three East Hawaii teachers were named "stars" Thursday by Gemini Observatory. They are the second Big Island trio to be named Star Teachers in Gemini's international exchange program with Chile. Tom Chun from the Keaau campus of Kamehameha Schools, Roddy Floral of Keaau High and Sonya Carvalho of Connections Public Charter School and their three counterparts in Chile, will visit each other's schools next year to share cultures, science and teaching techniques. A videoconference ceremony allowing all six teachers in the program to see one another took place Thursday at Gemini's University Park headquarters in Hilo, with televised feeds from the National Science Foundation in Arlington, Va., and La Serena, Chile, where Gemini also has an observatory. In April, Hawaii's Star Teachers will travel to schools in Chile. In October, the Chilean teachers will visit the Hawaii teachers' schools on the Big Island. The biennial Gemini-sponsored program began in 2003 in an effort to share culture and science between the two communities. Wayne Van Citters, director of the Astronomical Sciences Division at the National Science Foundation, which provides almost half of Gemini's funding, said "The Star Teachers program is doing something that may not be apparent at first glance -- inspiring our children to aim high." In 1994, Hawaii County and La Serena were officially recognized as sister cities and the program was developed as part of that relationship. The teachers' visits will include community and educational events, and more high-tech videoconferences between students in both communities. "As a celebration of the sister city relationship between our communities, I cannot think of a better way to share our aloha," said county Mayor Harry Kim at Thursday's teleconference. "As teachers of astronomy, we carry the early messages of our commonality," said Chun, who taught 35 years at Radford High School and later at Kamehameha Schools' Kapalama campus. "I believe we have the opportunity to bring people and places together." Chun, 59, has always taught physics, he said, but at Kamehameha's new Keaau campus he's started a new science academy, where he's introducing innovative techniques, such as fishing, to teach astronomy and other sciences to students. Keaau High's Floral, a science teacher, "thinks outside the box," said his principal, Ann Paulino, who marveled at the 29-year old's potential. "This is just a stepping stone for him," she said. Floral, a native of Detroit, Mich., came to the Big Island six years ago for a teaching certificate at University of Hawaii at Hilo and "good surf." He's the second Star Teacher from Keaau High, where he's in his fourth year, so he was around when the Chilean Star Teachers worked at Keaau High in 2003. "It was awesome interaction," he said, and it inspired him to apply. Floral also is a founder of Holo I Ke Kai, the voyaging program at Keaau High School that trains students to become crew members on the double-hulled voyaging canoe, the Makalii, and he's sailed numerous times in Hawaii. "You will hear from him for the things he does," Paulino predicted. "He has a real bright future." Carvalho came to Connections Public Charter School at the invitation of principal John Thatcher. "I met her at a science standards workshop and offered her the job the same day," Thatcher said. "She was enthusiastic, especially in the areas we emphasize. She fit right in and she really motivated a lot of kids. Carvalho, a 41-year-old Ka'u High School graduate, also coordinates the school's state science fair entries and was named "Best Junior Science Teacher" at the 46th State Science and Engineering Fair. "A major goal ... as an educator is to positively contribute to the academic and social development of my students," Carvalho said. "Gemini and the NSF have provided me with a perfect tool for furthering my goal and taking it to a higher level, one of learning with and from students and teachers of Chile." Hunter Bishop can be reached at hunter@hawaiitribune-herald.com. All rights reserved. Copyright © 2004 Hawaii Tribune Herald.